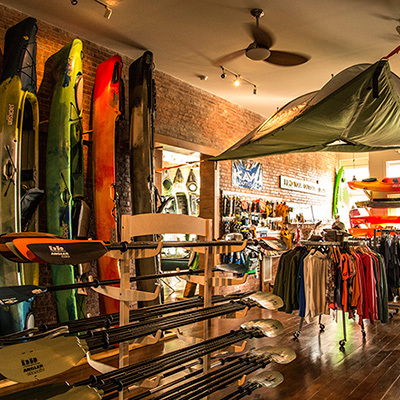 We have two locations - our downtown outdoors store, and our livery (where canoes and kayaks are rented). Beyond our two physical locations, AO has a lot of moving parts. We've organized this site according to the different aspects of our operation, which can be found below. If you just need a quick question answered, contact us at AO Store or AO Livery. All the gear we use, love and sell, along with all our local products. Guide books, stickers, limited edition t-shirts, and trail posters to name a few. We span a 107-mile stretch of the Allegheny River from Kinzua Dam to Emlenton. From a few hour day trip to a week-long excursion, the mighty Allegheny awaits! Plain and simple, we use the gear we sell. From kayaks to backpacks and everything in-between, our goal is to help you find the quality gear you need, at a fair price. AO staff is Leave No Trace Master Educator and American Canoe Association (ACA) Kayak Instructor Certified. From beginner to seasoned paddler, we have something for everyone. Check out our courses and workshops. At more than 500,000 acres, the Allegheny National Forest is Pennsylvania's premiere backpacking destination, and the closest thing we've found to "backcountry" in the state. Tents, packs, stoves and water filters - rent high quality gear! Women on the Water trips, moonlight paddles, fall foliage and snowshoe hikes! From beginner to experienced, our guided trips are a great way to meet and connect with other paddlers and hikers. With the proper planning, we can shuttle backpackers and paddlers throughout the Allegheny National Forest and along the Allegheny River. Get the most out of your visit to the Allegheny National Forest region! Where to stay, play, eat and shop - all in one place. We've helped dozens of Boy and Girl Scout troops from around the country plan float trips on the Allegheny River. Day trip or week-long excursion to tackle 100 miles - we're here to help! The Allegheny River and Allegheny National Forest are close to our heart - they are places we are always trying to learn more about and take care of. Get involved! AO Blog: A guide to adventuring! From understanding water levels in caution areas, to a day trip visiting waterfalls - our blog is a resource to help answers questions. We couldn't do what we do without a dedicated, hard-working crew. These are the folks that make it happen year after year! Trips, tips, pics, events and more. Become "one" with the Allegheny!